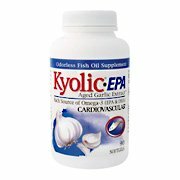 Kyolic aged garlic extract epa cardiovascular. Description: rich source of omega-3 (epa and dha). Helps maintain healthy blood pressure. Cardiovascular. Molecular distilled fish oil. Cardiovascular. Kyolic. Aged garlic extract. Begins with 100% organically grown garlic bulbs. They are then aged to perfection in a unique extraction process to eliminate odor and create beneficial compounds found only in kyolic. 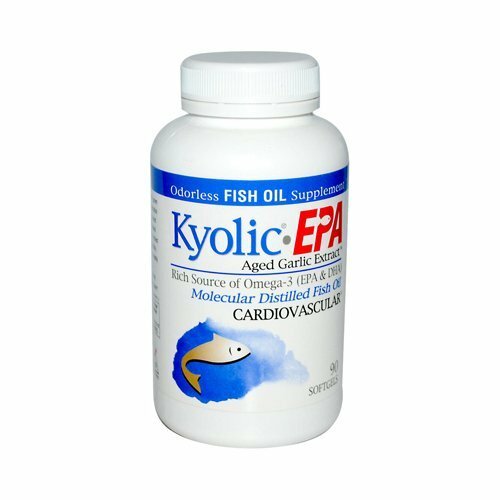 Kyolic-epa combines aged garlic extract with natural concentrated, molecular-distilled fish oil containing one of the most richest and purest sources of omega-3 essentially fatty acids (epa and dha). This select and synergistic combination of ingredients supports healthy cholesterol levels and overall cardiovascular well-being. Take the best - kyolic. Aged garlic extract, the most scientifically researched, highest quality and best-selling odorless sociable garlic. (in compliance with the california organic foods act of 1990) free of sodium, yeast, dairy, preservatives, sugar, gluten, artificial colors or flavors. Disclaimer: these statements have not been evaluated by the fda. These products are not intended to diagnose, treat, cure, or prevent any disease. 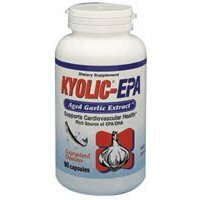 Kyolic Aged Garlic Extract EPA Cardiovascular. 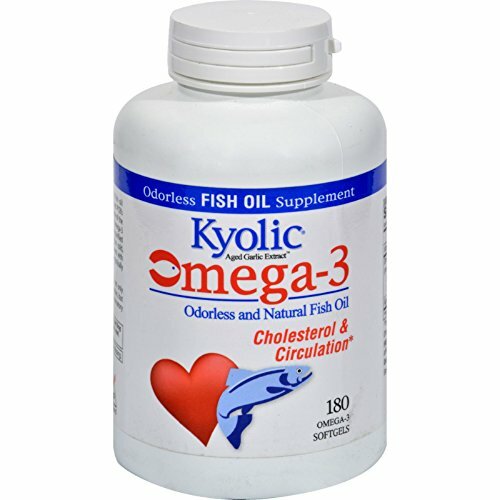 Description: Rich Source of Omega-3 (EPA and DHA. Helps Maintain Healthy Blood Pressure. Cardiovascular. Kyolic Aged Garlic Extract begins with 100% organically grown garlic bulbs. They are then aged to perfection in a unique extraction process to eliminate odor and create beneficial compounds found only in Kyolic. 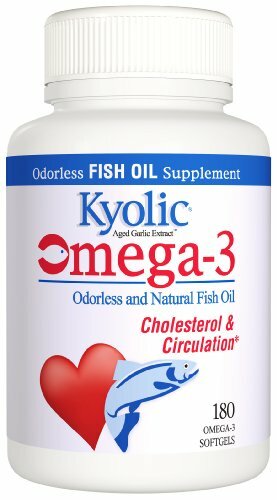 Kyolic-EPA combines Aged Garlic Extract with natural concentrated, molecular-distilled fish oil containing one of the richest and purest sources of Omega-3 essential fatty acids (EPA and DHA). This select and synergistic combination of ingredients supports healthy cholesterol levels and overall cardiovascular well-being. Take the best - Kyolic Aged Garlic Extract, the most scientifically researched, highest quality and best-selling odorless Sociable Garlic. Free Of Sodium, yeast, dairy, preservatives, sugar, gluten, artificial colors or flavors. Disclaimer These statements have not been evaluated by the FDA. These products are not intended to diagnose, treat, cure, or prevent any disease. Supplement Facts Serving Size 2 Capsules Amount per serving %Daily Value Vitamin E (d-a-tocopheryl succinate) 10 I.U. 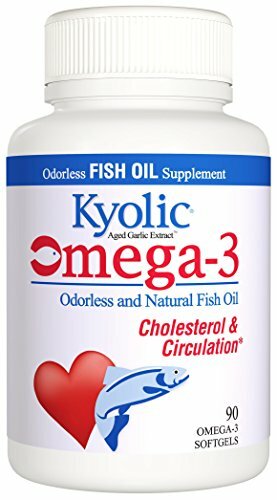 33% Fish oil concentrate 2000mg ** EPA (eicosapentaenoic acid) 600mg ** DHA (docosahexaenoic acid) 400mg ** Aged Garlic Extract Powder (Allium sativum) (bulb) 240mg ** Special Garlic Preparation **Daily Value not established OTHER INGREDIENTS: Fish Oil Concentrate, Glycerin, and Soft Gelatin Capsule. Free of: gluten, preservatives, sugar, sodium, milk, yeast, artificial colors and flavors. 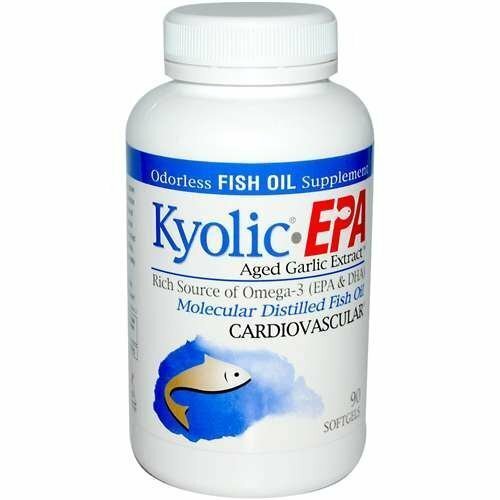 Kyolic Aged Garlic Extract EPA Cardiovascular Description: Rich Source of Omega-3 (EPA and DHA) Helps Maintain Healthy Blood Pressure Cardiovascular Kyolic Aged Garlic Extract begins with 100% organically grown garlic bulbs. They are then aged to perfection in a unique extraction process to eliminate odor and create beneficial compounds found only in Kyolic. 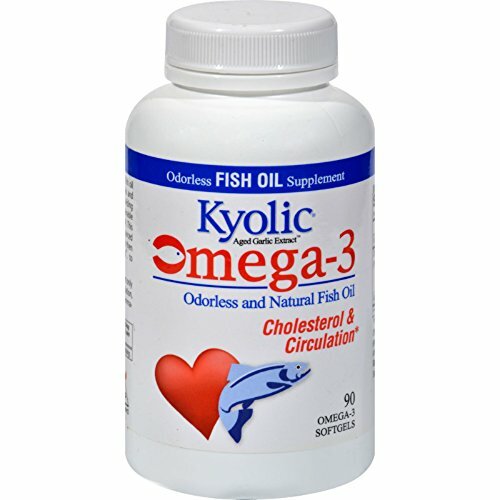 Kyolic-EPA combines Aged Garlic Extract with natural concentrated, molecular-distilled fish oil containing one of the richest and purest sources of Omega-3 essential fatty acids (EPA and DHA). This select and synergistic combination of ingredients supports healthy cholesterol levels and overall cardiovascular well-being. Take the best - Kyolic Aged Garlic Extract, the most scientifically researched, highest quality and best-selling odorless Sociable Garlic. Free Of Sodium, yeast, dairy, preservatives, sugar, gluten, artificial colors or flavors. Disclaimer These statements have not been evaluated by the FDA. These products are not intended to diagnose, treat, cure, or prevent any disease. Can You Reverse Coronary Atherosclerosis with Aged Garlic Extract?